Both of these teams will come into this Thursday night game in an optimistic mood after winning on Tuesday. This means one of these two sides will come out of this week’s double-header with a 100% record, which has to be seen as a fantastic outcome for what is certainly a grueling couple of days for the top teams in European basketball. 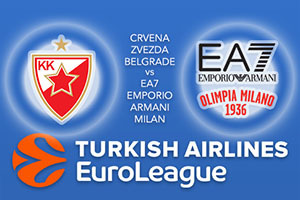 The hosts have a 3-4 record while the Italians carry a 4-3 record coming into Round 8 of the Euroleague. The Serbian side grabbed a thrilling 78-79 win over Brose Bamberg on Tuesday and it went right down to the wire. These games can be mentally draining but the boost that you receive for seeing out the win can go a long way and you can expect these Crvena players to be flying heading into this match. Marko Simunovic has an average of 11 points per game this season while Marko Guduric is the only other Crvena player in double figures, with a tally of 10.1 points per game this season. If these players can improve on these figures this midweek, it could be a brilliant run of games for Belgrade. It has been an up and down season for Milan so far but they’ll be feeling a bit better about themselves at this point. The Italians started the campaign with two wins but then went to lose their next three games of the season. However, they have responded in the best possible way, winning their last two games, giving them a 4-3 record heading into Round 8. This is going to be a tricky away tie for Milan but they’ll fancy their chances of grabbing a win. Rakim Sanders grabbed 19 points in Tuesday night’s win and he has averaged 16 points per game this season. This game could go either way but take EA7 Emporio Armani Milan at -2, which is provided at odds of 1.90. There is an Over/Under market available for this Euroleague game and you should go OVER 158.5 which you can find at odds of 1.90. Bet Now!